Originally an Ohio native, I’ve been fishing since around the age of five. Something about fishing clicked with me immediately, like it was part of my DNA. Growing up, I fished for almost every species that swam near me. Largemouth bass in local lakes were my favorite target. Occasionally I would make it to Lake Erie for walleye and perch. Next came trout and smallmouth bass in Michigan, followed by a long list of inshore and offshore species in Florida. As my addiction grew, I began recording every fishing show I could find. Magazines were my other source of new information, which I snuck into school regularly… sorry Mom. 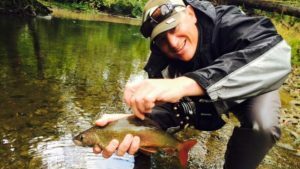 After moving to Denver Colorado in 1992, I knew learning to fly fish was important to get the most out of the state’s trout streams and lakes. I sought the expertise of local fly fishing guides to learn skills. Books, magazines, and classes rounded out my growing obsession. Nearby Cheesman Canyon on the South Platte River became my favorite fishery. I started taking friends there and soon realized how satisfying it was to help them experience catching trout on the fly. This led to my pursuit of becoming a professional fly fishing guide! Fourteen years later, Galvin Guiding was born. I’m always eager to learn new wrinkles of the sport. Luckily, fly fishing is an sport that allows for continuous growth and learning. The desire to keep getting better led me to competitive fly fishing. I was introduced to it starting with the 2006 National Fly Fishing Championships held in Boulder, CO. 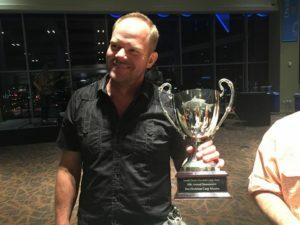 The coaches of Fly Fishing Team USA wanted an all-Colorado team to serve as a benchmark to their current team anglers., and I was picked to join. To almost everyone’s surprise, our team ended up with the bronze medal. I placed 10th individually. Boom… I became addicted and kept searching for new and cutting edge information from the U.S. and abroad. A love affair with competitive fly angling has followed. I’ve competed in four to five fly fishing tournaments a year ever since, including each of the U.S. National Fly Fishing Championships. Most recently I was able to win the 2015 Conejos Superfly and the 2015, 2016, and 2017 South Platte Pro-Am Carp Slams. Competitive fly angling for trout helps keep me on top of new techniques and flies. Most every competition I’ve attended follow the FIPS Mouche rules of fly angling. Most notably, you can’t use attached weight or indicators on your line. These restricitons actually open up the angler to an array of new possibilities to catch fish. It was from competitive fly fishing that European Nymphing or euronymphing was born. Though I prefer to call it “competition nymphing“. I’ve enjoyed competing across the country over the years. Tournaments in Oregon, Idaho, Michigan, Nevada, New Mexico, North Carolina, Pennsylvania, and Colorado have broadened my game and taught me to catch trout in different types of waters. It is becoming no secret that I have an obsession with love to fly fish for carp. The angling public is quickly catching on about how fun this species is to pursue with a fly rod! Fishing to carp with a fly is a new frontier for many fly anglers. A guided carp fly fishing trip can help get you started in this niche! Check out our dedicated carp page right here. When asked to describe my guiding style, the words “technical” and “patient” come to mind. I feel instruction is an integral part of the guided experience. The skills required to catch fish can be broken down into steps that are easy for anyone to learn. I’ve spent thousands of hours guiding fly anglers and fly fishing personally. My goal is to be able to answer most questions, especially why and how. Novices should not be intimidated by the common myth that the sport is difficult to learn. With proper instruction, the learning curve is not too steep – but it sure is fun! Davis was born and raised in Denver, CO and was taught to fly fish by the time he was 5. Davis grew up in a family where “fly fishing was a religion” and his grandfather, uncle and dad taught him the ins and outs at a young age. Davis fished throughout many of Colorado’s pristine trout streams as a kid especially near the front range of Colorado. He is incredibly passionate about passing on his love for fly fishing to other people and loves nothing more than bringing people to the beautiful rivers and lakes that we call home! While attending Colorado College in Colorado Springs and living in Denver in the summer, Davis spends over 250 days on the water each year and knows our waters like the back of his hand. In the fall, winter and spring you can find Davis chasing large wild fish throughout Colorado and beyond and in the summer you can find him fishing for carp and trout near Denver. Kirk grew up in Casper Wyoming, and started fly fishing with his father and avid fly fisherman around the age of 10. He and his father fished streams throughout central and southern Wyoming. After moving to Colorado in 2000 Kirk has Fly fished throughout colorado and the front range extensively, concentrating mostly on trout. Kirk enjoys fishing streams and stillwater alike, he began guiding to pass along knowledge gained from many years of enjoyment on the water. Kirk has been working and competing for a place on Fly Fishing Team USA. He competes in regional events throughout the nation, against some of the finest anglers. Currently he is ranked well and we hope his efforts payoff! Jeremy, a Colorado native, started fishing his home state as many of us do, with conventional tackle. A move to South Florida in 2002 gave him the opportunity to advance and broaden his fishing experience, chasing a multitude of species. 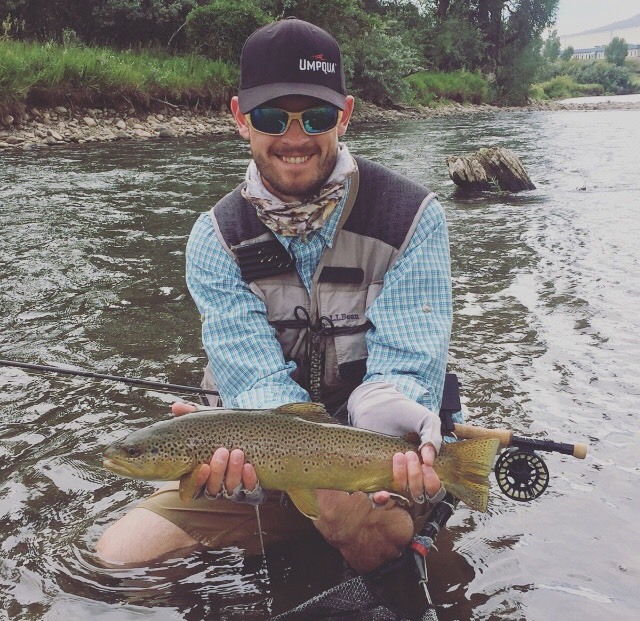 After moving back to Colorado in 2010, Jeremy has become a dedicated (some might say obsessive) fly fisherman spending a lot of time on the water. He became enamored with the state’s stunning varieties of trout, and their habitats from the front range creeks to to high mountain rivers and lakes. Jeremy frequently travels to Wyoming to pursue the trout of the North Platte. In addition, he still flies to Florida for all kinds of fresh and salt water species including tarpon, snook, and peacock bass. 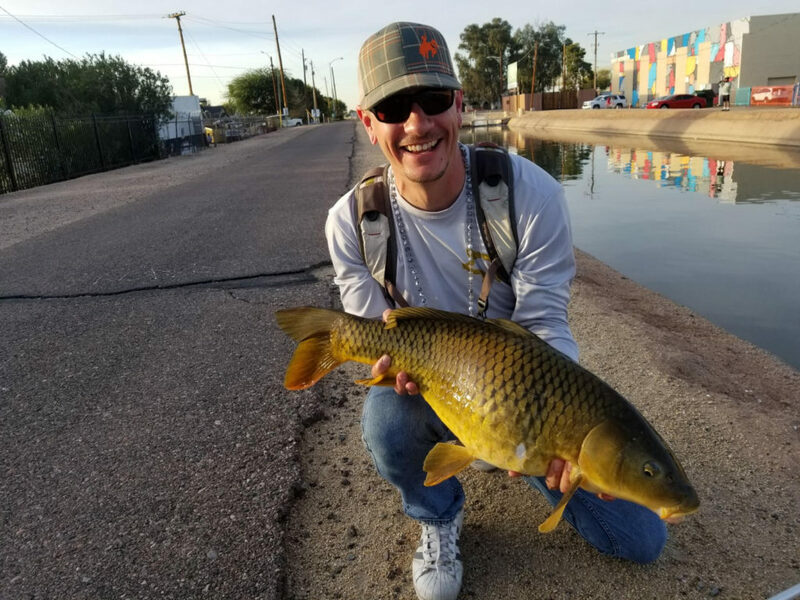 Frequently, you’ll find Jeremy on our local watershed, the Denver South Platte (DSP), or one of our local lakes fly fishing for carp. His goal is to knock our very own 3x Carp Slam champion, Chris Galvin, off the top of the podium! Jeremy is a well rounded angler, comfortable with both fly and spin gear. Book a trip with the colorful Jeremy and be prepared for laughs, adventure, and fish! Ed hails originally from Boise, Idaho, and has been fly fishing since his early teens. He moved to Colorado in 2010 for school and has lived around Denver ever since. 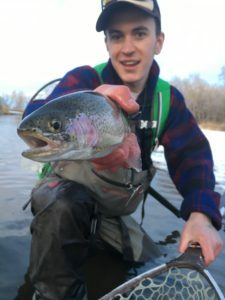 Late in his college career he became affiliated with the Fly Fishing Team USA circuit, and has competed in two U.S. National Championships to date. Ed prefers fishing the freestone streams of Northern and Central Colorado, and has also love exploring the stillwaters of Colorado and southern Wyoming. Additionally, he has fished for bonefish, tarpon, and snook in Belize. His time spent competing has him favoring tight-line nymphing (Euronymphing) or a dry-dropper-dropper setup, but is quick to switch to dry flies when the fish start rising! In lakes, he prefers to fish loch-style, drifting with the wind in a driftboat or float tube. There, he enjoys stripping streamers or crawling bugs on a full-sinking line.